Aeeeeeeeeeeeeeeeeee! Ahem... Sorry for that. 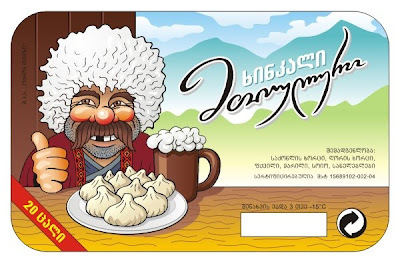 It's just a fit of my genetic craziness about khinkali, shared by many of my compatriots, for whom eating this traditional Georgian sort of meat dumplings is always a special occasion and a joyful event, because we usually eat khinkali in a merry company of our friends and family members. Besides, it's really tasty! Khinkali is believed to be originated from Pshavi, a historical Georgian province on the southern foothills of Greater Caucasus. From there, it spread to the neighboring places and became a trademark dish for Khevsureti, Tusheti, Mtiuleti and other highland provinces. So, my genetic affection to khinkali is doubled, because my family name, Kaishauri, also comes from that part of Georgia. Today khinkali is widely (and wildly) popular throughout all Georgia and is considered a nationwide culinary heritage, but still, the "real" khinkali is always associated with the places of its origin. 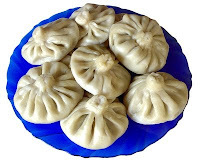 That's why many semi-prepared food manufacturers tend to distinguish their khinkali with titles based on the associated regions (Khevsuretian, Tushetian, Mtiuletian) or geographical names (Shatili, Pasanauri). Of course, these products have very little in common with the traditional cooking methods practiced in the "home regions" of khinkali, they just try to bring an air of authenticity. This is exactly the case of the dish we have on the menu today. It's called Mtiuluri Khinkali, implying it's somehow related to Mtiuleti, one of the renowned "khinkali provinces." But, as you could have guessed, it's rather a wish than reality. In fact, the product doesn't even stand up to the standards of a regular "urban" khinkali, not mentioning a Mtiuletian one, because it features soy as an ingredient -- a cheap "mass addition" to the meat. Of course, the highlander's genes in me were terribly outraged by this heresy, but then I remembered my three wives and eleven children, and after some brief inner struggle (about 5 seconds) decided to take the order... Alright, alright, I do such things on a daily basis and I feel no shame. Satisfied? So, what's a Mtiuletian khinkali without something Mtiuletian? 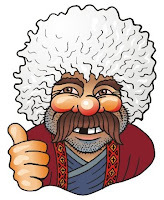 I remembered the famous series of paintings by Gigo Gabashvili, depicting drunken Khevsurs. They are not Mtiuls, but very close. I decided to make my own version of a drunken highlander, very "cartoonish" and light-hearted. Naturally, he had to be unshaven, wearing a mustache and a papakhi. A quick marker drawing, scanning, tracing, coloring and my drunken Mtiuli was all ready. Somewhere in the process he lost a front tooth, but that's OK.
Now all he needed was a dish full of khinkali, suitable in visual style. More drawing, tracing and coloring... and here it was. But wait... there was something missing from the picture. Ah, a jug of beer! What's khinkali without good fresh beer? Either that, or vodka... but I prefer beer with khinkali. My label, my choice! Waiter, a beer over here! That's it. If you ever come to Georgia, you absolutely have to try khinkali. Heh... who am I kidding here? You WILL HAVE NO CHOICE but to try -- just don't resist, it's futile. I'm sure you're gonna like it. Well, George W. Bush certainly did, if it helps... And don't be afraid: we treat our guests only with best khinkali -- no soy, no cheap tricks, only the real thing!